A backhoe like this was reported stolen. Police have located a generator reported stolen from a base yard in Kailua-Kona but are still looking for a backhoe. 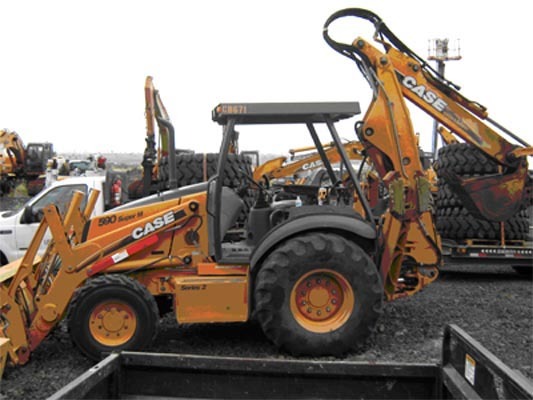 On June 15 a representative of Allied Machinery base yard on Hulikoa Drive reported that a yellow 2002 Case 590SM four-wheel drive Extendahoe backhoe and a 2006 Multiquip generator were stolen sometime between June 10 and June 15. Both the backhoe and the generator are marked with Allied Machinery’s inventory numbers in stenciled paint. The generator was found parked outside the company’s gate Tuesday morning. The backhoe is still missing. Police ask that anyone with information about this theft and/or the location of the stolen backhoe call Officer William Simpson IV at 326-4646, ext. 253, or the Police Department’s non-emergency line at 935-3311. Tipsters who wish to remain anonymous can call Crime Stoppers at 329-8181 in West Hawai’i or 961-8300 in East Hawai’i.